Mackerel in Coconut Vinaigrette ~ I Can Do That! Marinate the fish cubes in half cup of the vinegar for 15 minutes. Drain well and discard vinegar. 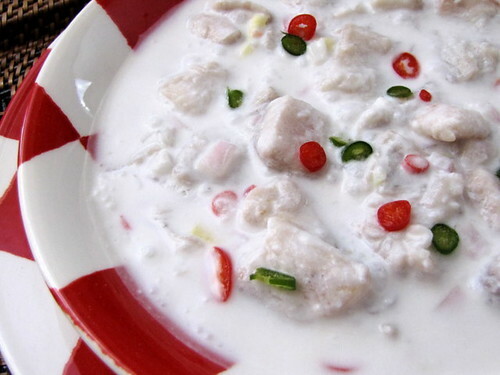 In a glass bowl, combine the remaining half cup of vinegar, coconut milk, fish, shallots, ginger, sliced hot peppers, salt, and ground white peppercorns. Cover with plastic wrap and chill in the refrigerator for 2 hours. Transfer into a serving plate and garnish with shallot and hot pepper. Oh boy miss again this one. Happy FF! Never tried this out...sounds good.